Just a few minutes walk north of the bustling city center, the Mount Vernon neighborhood is the home to world-class institutions, unique shops and restaurants, and the nation’s first monument to honor George Washington. 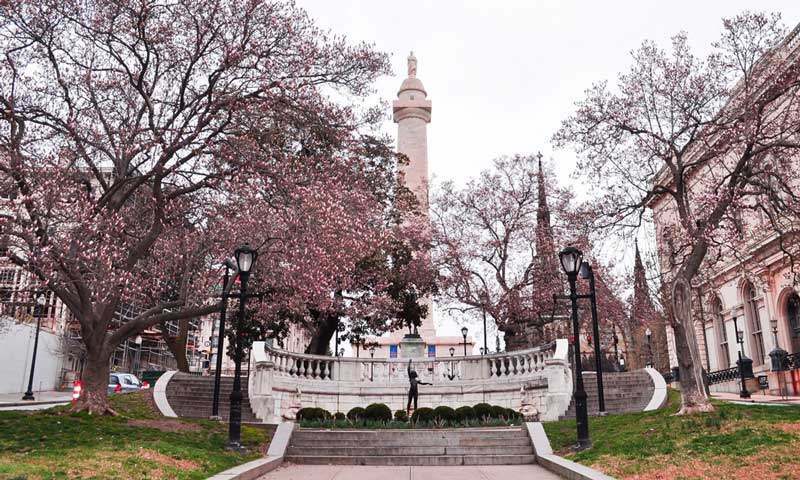 At the neighborhood’s heart lies Mount Vernon Place, a cross-shaped park area featuring landscaped squares fronted by elegant mansions and townhouses. At the center of the park rises Baltimore’s Washington Monument. Completed in 1829, the impressive structure stands 176 tall (including Washington’s statue). Adventurous visitors can climb the 227 marble steps to the top for a unique view of the city. Mount Vernon Place is also home to the Peabody Institute, America’s first conservatory of music and home to the stunning Peabody Library, described as a “cathedral of books.” Nearby the Walters Art Museum displays antiquities and treasures from around the world. Mount Vernon is also home to the Maryland Historical Society, where visitors can sneak a peek at the original handwritten manuscript of the National Anthem. Baltimore Center Stage and Spotlighters Theatre entertain patrons with a variety of plays and musicals. On the north end of the neighbor stands the Meyerhoff Symphony Hall, home to the Baltimore Symphony Orchestra.